Ezra Klein of the Washington Post was interviewed on MSNBC. He was asked to respond to the 112th Congress reading the US Constitution on January 6, 2011. His response, though stupefying, was consistent with the attitudes of the left and what would be expected from an associate of the Washington Post. Ezra Klein, which of these provisions of the US Constitution do you consider confusing and non binding? Ezra Klein, after being bombarded with responses to his idiotic statements, posted a “clarification” of his remarks. The problem I mostly have with Mr. Klein is his cavalier attitude in regard to the US Constitution. He must have a great many followers on the left. Yes, Ezra Klein, the fault is yours. And once again, which provision is ok for you or the Supreme Court to declare not binding? Ezra Klein, welcome the the US Constitution Hall of Shame. I would like to thank William A. Jacobson, Associate Clinical Professor, Cornell Law School, for an excellent article on the Obama eligibility controversies and for allowing my comment on his blog. “There is a bizarre intellectual dance taking place around the topic of Barack Obama’s birthplace. “Why isn’t everyone who believes the “Birthers” to be driven by hatred and racism, and motivated by politics, doing what Obama’s family friend and the new Democratic Governor of Hawaii wants to do, rebut and rebuke with the best evidence? There were some really interesting comments placed under the article. I urge you to read them. Not the least of them was one from Captain Pamela Barnett. I appreciate that it seems that you are trying to be honest…. SCOTUS rulings prove that obama is not a natural born citizen because he had a foreign father that was NEVER a U.S. citizen. I see a lot of supposedly smart liberal educators ignore this fact. I am suing obama and it did NOT ever stem from hate. I fight for truth and justice under our Constitution. The only question of Natural born centers around where a child was born.. Parent citizenship has always been required to be of TWO citizen parents. If Obama was born in HI as he claims but has not proven, he would only be a NATIVE born citizen as he says on his own campaign website. Native and Natural Born are not equal. Native is Jus solis, but ignores the jus sanquenis aspect to make him Natural Born. There is also a difference between being Born a citizen and natural born. you can also see my new website unlawfulpresident dot com for videos that support my belief obama is not NBC. Why has Obama, for over 2 years, employed numerous private and government attorneys to avoid presenting a legitimate birth certificate and college records? With all due respect, there is no credible circumstantial evidence that Obama was born in Hawaii. As a matter of fact, the efforts expended in keeping the records hidden and covering up put suspicion on where he was born. Has Governor Neil Abercrombie backed off of his campaign of lies to protect Obama? Abercrombie, over the past several weeks, broadcast a morass of Orwellian half truths and lies which allowed the mainstream Big Brother press, prominently represented by CNN and MSNBC to repeat the lies as Joseph Goebbels stated. Chris Matthews, Neil Abercrombie, Clarence Page, David Corn. People in Kenya knew Obama’s parents, so he must have been born there, applying that logic. Jerome Corsi, at World Net Daily, has provided some excellent background info on Neil Abercrombie. “Although Hawaii’s newly elected Democrat governor, Neil Abercrombie, has recently given a flurry of high-profile media interviews condemning “birthers” who question Barack Obama’s constitutional eligibility to occupy the Oval Office, suddenly he is declining to answer a few hard questions. Abercrombie, 72, a former member of the U.S. House, may be trying to quell the surge of doubt among Americans – polls show nearly six in 10 doubt Obama’s own eligibility story – by promising he will try to release additional records on Obama from his state’s Department of Health vault. He has, in just recent days, expressed his disdain toward “birthers” in the New York Times, the Los Angeles Times, the Chicago Tribune, on CNN, as well as the local Star Advertiser and Hawaii News Now. “Abercrombie was a graduate teaching assistant in sociology at the University of Hawaii when Barack Obama Sr. arrived in 1959 from Kenya to enroll as the first African-born student in the university’s history. In August 1961, when Barack Obama Jr. was born, Barack Obama Sr. maintained a separated address on 11th Avenue, in Hawaii. “During his gubernatorial campaign, Abercrombie blasted WND for publishing a report that Abercrombie was listed as a member of the U.S.-based Marxist-oriented Democratic Socialists of America. Trevor Loudon of the New Zeal blog, a researcher on communism, uncovered the November-December 1990 issue of the Democratic Socialists of America’s official magazine, “The Democratic Left,” that listed Abercrombie as a member of the party. Chris Matthews interviewed Clarence Page and David Corn regarding Neil Abercrombie’s recent remarks about Obama and his birth certificate. If you are really paying attention, you realize that Abercrombie made those statements to provide a forum for the Orwellian Big Brotherhood of the mainstream media to continue to spread their lies about Obama and his eligibility issues. There is no bigger liar on this subject than Chris Matthews. However, Page and Corn proved yesterday that they are strong competitors. Here is some background information on what Neil Abercrombie has been up to. who loved his mom and dad. Let’s examine some of the transcript from Chris Matthews show yesterday. The transcript passages were taken from the MSNBC site and closely match the video. My response: This is the most honest thing Matthews has said in a long time. Interpretation: Matthews is an enemy of the US Constitution and the American people. My response: If Obama is not eligible, he is not president. What does Abercrombie being in Hawaii and being friends with Obama’s parents have to do with proof Obama was born there? And who is accusing Obama’s parents of anything? Not wanting evidence of Obama’s US birth? That is all we have been trying to get for over 2 years. And once again, it is not Obama’s US Citizenship that is in question, it is his natural born citizen status. My response: There is no evidence out there of Obama having a Hawaii long form birth certificate. He has employed many attorneys to avoid presenting one. The birth announcements were automatic when the COLB was applied for. My response: The only true statement by Page. My response: An attempt by Matthews to ask questions, but in reality playing the “straight man” role for the next lie. My response: This is really easy to answer. If you did not get this on your own, go to Constitution 101. You do not have to be a natural born citizen to get a passport!!! Yesterday, December 26, 2010, the Citizen Wells blog reported on the interview of newly elected Hawaii Governor Neil Abercrombie by Hawaii News Now, KGMB, KHNL. Abercrombie, who admits to being friends with Obama and Obama’s parents, continues his Orwellian choice of words and outright lies to protect Obama. Hawaii News Now included a June 2008 article from Citizen Wells in their video. I thanked them in the article and subsequent email. More on Abercrombie lies and deception from Citizen Wells December 24, 2010. “Let’s examine the first piece of Orwellian spin by Abercrombie (with the help of the LA Times). I was here when that baby was born. Does that mean Obama was born in NC? First of all, the COLB posted on the internet is a certification not certificate. The one posted on the internet was never validated as having been issued by the state of Hawaii. And even if it had been, a HI COLB does not prove birth in Hawaii. It is as Lou Dobbs stated, a document that refers to another document. Would you trust securing the office of the presidency and upholding the US Constitution to these two FactCheck.org employees? 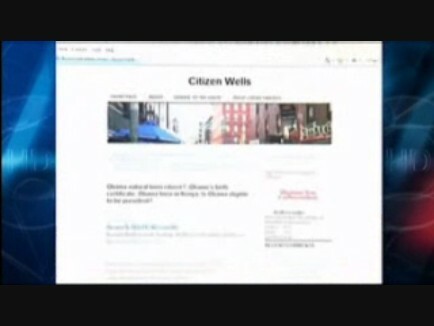 Notice that the June 10, 2008 Citizen Wells article they include in their video is from the old format of the blog. It appears that someone had saved a copy of it months ago. I am ok with that and it might even be a good thing. Who knows. I just realized that this copy of the screen had to have been saved before late 2008 when the headings were changed. Hawaii News Now, KGMB, KHNL, recently interviewed newly elected Governor of Hawaii, Neil Abercrombie. Abercrombie, entrenched in the corruption in Hawaii and the Democrat party and an admitted friend of Obama and Obama’s parents, lies to cover for Obama’s eligibility issues. Hawaii News Now included a reference to the Citizen Wells Blog in the interview video. I would like to thank them for doing so and I encourage them to contact me for the rest of the story, the truth and facts regarding Obama’s eligibility issues. Hawaii News Now correctly refers to the document provided by the Obama Campaign as a Certification of Live Birth (COLB), but they interchange the term citizen for natural born citizen. Presidential eligibility requires being a natural born citizen. In the interview Neil Abercrombie admits to being friends with Obama and Obama’s parents. He is another example from the Hawaii and Democrat party corruption machines that the end justifies the means. No Governor Abercrombie. This has to do with respecting the US Constitution, office of the presidency and the American people! Many thanks to the Birther Report for the heads up on the interview.